© 2017 by Patricia McGoldrick All rights reserved for author's blog text, author's poems and author's photos. If found elsewhere, it has been illegally scraped and should be reported to me at link. Writing works for me! In my writing, I am inspired by words of Spanish artist Joan Miró who said "I try to apply colors like words that shape poems, like notes that shape music". HOLIDAY SATISFACTION — VISIT PEI! Summer hiatus is still on; however, on returning from a vacation in Prince Edward Island (PEI), I couldn’t resist responding to the Daily Post Weekly photo challenge, Satisfaction. This year’s holiday trip to PEI gave time to get reacquainted with our smallest province, one that is blessed with so much natural beauty, friendly people and great food. The sea air, sandy beaches and perfect weather combined to satisfy a trip planning goal or two, for sure. There were opportunities to enjoy drama productions, museums, local music and a huge country music festival with top artists. A George Bernard Shaw play, Mrs. Warren’s Profession, was staged in a theatre that has been successful for several years. Museums reflected aspects of local history — potatoes, Acadian people, maritimes. We enjoyed Acadian song and fiddle music plus a family ceilidh. Alas, we only heard the country festival from a near distance. The island has so much natural beauty that is quite evident on driving through the various areas. Almost everywhere along the roadways, one sees lupins standing tall in pink, white, purple. On this, my second trip to the island, I also got a refresher on some history of this part of the world when European powers — Britain & France — were still squabbling over territory & peoples on this side of the pond. The Acadian people were one of the groups that suffered from their imperial power trips. Fortunately, many survived the expulsion from Acadia. Descendants of these early settlers, like the lupins of PEI, can be found in many locales, in the Maritimes and elsewhere sharing their unique music, dance & culture with a proud, indomitable spirit. Overall, the trip provided a great deal of satisfaction for two Ontario travellers! In response to the The Daily Post Weekly Photo Challenge Look Up, I immediately thought of the sky. As I have mentioned previously, clouds are a real drawing card for me. I like the ever-changing skyscape. Sometimes, however, there is another type of substance in the sky — those puffy white trails left as jets soar across the sky. As I watch them appear, then dissipate, I wonder to myself about the destination of this plane, the passengers and their baggage of hopes and dreams. Safe journey to all! Announcement: Thanks to all who responded to my recent blog post! The bird seen in the right side of photo was a hawk. This bird of prey is a frequent flyer in this area. Ironically, perhaps, I found a Daily Post photo challenge, Sky, that is spot-on with my recent Cumulus Catch. 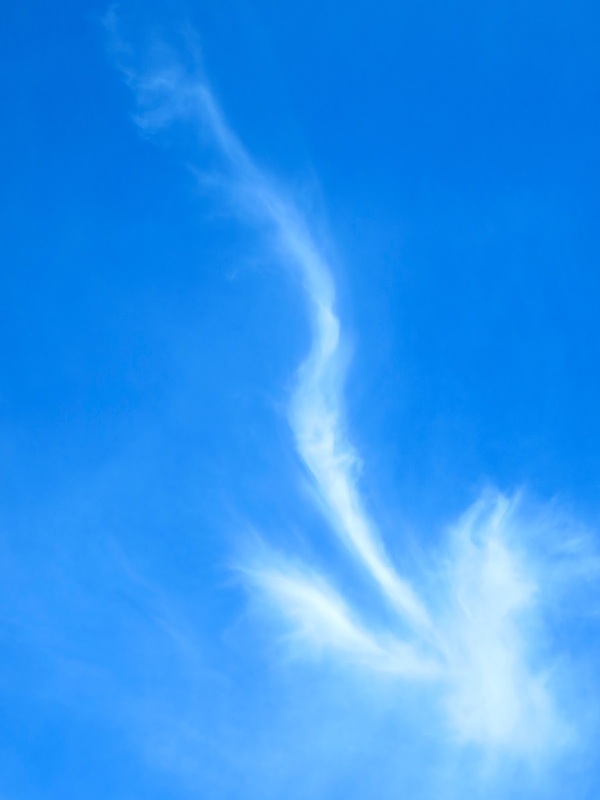 Due to the timing of this challenge, I thought that I would linger a bit on the cloud theme, sharing my photo of an arrow cloud here and a couple of poems below. This week has offered a feast of planets in the night-time sky. Check out EarthSky site! However, it is the day-time clouds that mostly draw my attention, even lead to a poem or two. These two poems were written a few years ago, in response to a prompt at Poetic Asides. On a Grateful Friday, I would like to share these “sky” related poems which were inspired by an online group of poetic voices for which I am so grateful to have met. Have to confess — I am a cloud-watcher from way back! Fortunately, I live in a house that is built on a hillside with a deck that overlooks some beautiful trees and houses. Also, it provides an all-season view of clouds. Storm clouds, cirrus, shelf clouds and many others come and go as the seasons pass. Whether I see faces or animals outlined in the sky, I am particularly drawn to cumulus clouds in their various forms. The sky is clear and blue today but I thought that I would share this photo that I took of a cumulus cloud (on its way to cumulonimbus?) some time ago as I tried to capture a feathered frequent flyer. Can you spot the bird? Identify this one, too? Please let me know in a comment below. Life Imitates Art is the photo challenge theme for this week. This amazing cloud structure that I photographed a while back came to mind. Have a great week!